REDDING, Calif. – Barbara (Sands) Hawes traveled more than 2,000 miles to celebrate a milestone during Simpson University's recent Homecoming Weekend. 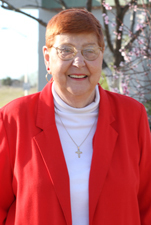 Hawes, who is 74, graduated from Simpson Bible College in San Francisco in 1961 – making 2011 the 50th year since she earned her degree in Bible and Christian Education. It was the first time Hawes had visited the Redding campus, where Simpson relocated in 1989. "I've been contributing to the scholarship fund for a few years and am excited to see this campus," she said. "I would love for my granddaughter to come here." Much has changed in the half-century since Hawes was a student. She noted how much more contemporary the music in chapel is and the differences in student dress code. "But it's consistent with the times," she added. When she attended Simpson, tuition for a year cost $415. Tuition with room and board was $985 a year. Hawes did not receive any scholarship money, so she worked as a secretary and waitress to afford her education. "My mom and dad paid for as much as they could, but the rest was up to me," she said. One of her jobs was in The Biltmore coffee shop on campus. Among her fond memories was a beach party held for the students. "I remember the Dean of Women, Mrs. K, insisted we had to wear a robe over our bathing suits," she said. "We thought it was so silly. Fortunately, Dr. Bob Ross came to our rescue." During her sophomore year at Simpson, Hawes developed Crohn's disease, an inflammatory disease of the intestines. She had surgery after graduation and said she has seen God's protection as she has dealt with the disease. "God's just taken care of me. That's all there is to it," she said. Hawes has been editor of two newsletters for ostomy support groups in Virginia for 20 years. When Hawes was 30, she moved to Hawaii, where her cousin was stationed with the Navy. "I went to get a man and a tan," she laughed. "I got both." She and her husband, Bill, also a Navy man, have been married for 42 years. Their son, Bob, was born in 1970 in England. While stationed in Chile, they adopted a 1-year-old girl, Beth in 1974. The Hawes have six grandchildren. Hawes said her Simpson education helped prepare her for ministry. She and Bill began an English-language church in Santiago, Chile with an Air Force couple and Southern Baptist missionaries, and she continues to help the homeless and do other mission work in Virginia. "As a product of Pasadena Alliance Church, I've always had a heart for missions," she said. "Simpson just further developed that."